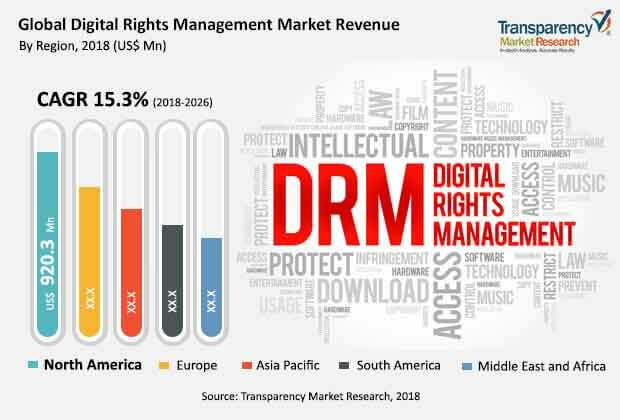 The global digital rights management (DRM) market is expected to expand at a significant pace during the forecast period, due to the rising demand of digital content security and management. Increasing digital piracy and thefts of digital content call for content security and management solutions. This factor is driving the global digital rights management market. Furthermore, the adoption of innovative revenue models and introduction of stringent policies and regulations by governments for protection of intellectual property (IP) from unfair usage and illegal competition are also driving the digital rights management market. However, currently, the DRM market is witnessing scarcity of unified DRM solutions. Thus, for complete security, end-users need to opt for multiple DRM solutions, resulting in high initial investments and high after-sales maintenance. Hence, scarcity of unified DRM systems is hindering the market. The market for digital rights management is projected to reach value of US$ 9,086.8 Mn by 2026, registering a CAGR of 15.3% during the forecast period. Digital rights management (DRM) is a technology to protect ownership or copyright of the digital content by limiting what actions an authorized beneficiary may take in regard to the digital content. DRM enables the owner or publisher of the digital content to securely distribute precious content such as periodicals, enterprise-important data, photographs, books, educational material, and videos and to protect the digital content from thefts and piracy. Digital rights management is a software application or technology-enabled solution to control and monitor the unauthorized access of the digital content. DRM supports controlling, monitoring, organizing, and distribution of the digital content, with solutions deployed either on-premise or based on cloud or as a hybrid model. Industries that can benefit from digital rights management software are health care, BFSI, government, media & entertainment, and retail & consumers. Digital rights management is most commonly used in the media & entertainment industry. This is primarily due to high volume of the content generated, its wide online dispersion, and the growing number of media & entertainment companies, which increases the demand for enhanced control over images, videos, and audios from multiple sources. However, with no typical DRM standard implemented, several DRM leaders have developed and promoted their own solutions. Presently, more than 20 applications are available in the market. If a customer wants to avail services of multiple companies, he/she has to purchase different versions of software and manage all of them separately. This is an inconvenience that could lead to DRM complexity and additional expenditure. Hence, requirement from consumers for a unified DRM solution, which can take care of all platforms of different vendors, is rising. However, lack of availability of such unified solutions is likely to hamper the market during the forecast period. A key trend in the market is increasing demand for cloud-based solutions. This is because the demand for digital rights management solutions for a specific device and at a specific client location is raising the complexity for vendors. DRM systems need to serve a wide variety of devices popular among consumers. This leads to integrating, operating, and maintaining various DRM systems, resulting in increase in complexities and loss of revenues. However, cloud-based DRM allows the operator to outsource the DRM solution and offload various on-site operations to cloud. It also helps in freeing up valuable resources, which can be allocated to execute other significant tasks. Cloud-based DRM is essential while tapping opportunities provided by video on demand (VoD), as the storage capacity offered on a mobile device is not sufficient to stream a high-quality video in real time. Cloud services is an efficient way to optimize DRM operations while availing a robust level of service. Transfer of license keys and several security functions from the client device to the server is simplified by using the cloud deployment model. This allows easier management, updates, and support for multiple DRMs, formats, protocols, and evolving business models. Due to these value additions, cloud-based solutions are likely to become popular. This is anticipated to provide substantial growth opportunities to the global DRM market in the near future. The global digital rights management market has been segmented based on component, deployment model, and end-use. Based on component, the market has been segmented into software and services. The services segment has been sub-segmented into consulting, integration, and operation & maintenance. Based on end-use, the market has been divided into health care, BFSI, government, media & entertainment, retail & consumers, and others. Among regions, North America is anticipated to witness rise in the consumption of digital media in the next few years. Increasing adoption of IPTV, OTT, and IoT technologies by consumers in the region is likely to boost the digital rights management market in North America in the next few years. The Asia Pacific digital rights management market is anticipated to expand at a higher rate during the forecast period, due to growing digitization in the region and rising demand to secure the digital content. Furthermore, the markets in Europe, Middle East & Africa, and South America are expected to expand significantly during the forecast period. The digital rights management market is largely characterized by mergers and acquisitions and partnerships. For instance, as a part of its strategy, Vera Security, Inc. partnered with Canon Inc. in February 2018. This partnership would help enterprises to protect their business information and intellectual property from data leaks. Combining of solutions of both companies would allow customers to have access to a secure and trusted workflow platform. Some of the key players profiled in this report on the digital rights management market are Conax AS, Intertrust Technologies Corporation, Adobe Systems Incorporated, Oracle Corporation, Apple Inc., Microsoft Corporation, Locklizard Limited, Vaultize Technologies, Verimatrix, Inc., OpenText Corp., Seclore Technology, Vera Security, Inc., Vitrium Systems Inc., Dell EMC, Fasoo, Inc., Intralinks, Inc., and Nextlabs, Inc.. This comprehensive report by Transparency Market Research analyzes and forecasts the digital rights management market at the global, regional, and country level. The report provides an analysis of the industry trends in each of the segments for the period 2016–2026, wherein 2018 to 2026 is the forecast period and the base year is 2017. The global digital rights management report provides an in-depth and accurate analysis of market investment across solutions covered in its scope. It also highlights various drivers, restraints, and opportunities expected to influence the market’s expansion during the said period. The study provides a complete perspective about the market for digital rights management solutions and services in terms of value (in US$ Mn) across geographies, segmented into North America, Asia Pacific (APAC), South America, Middle East & Africa (MEA), and Europe. Moreover, the study explains the penetration of each market segment within various geographies and how these segments have accelerated the expansion of the market. The digital rights management market report covers all the major trends and technologies playing a major role in terms of market expansion over the forecast period. The study provides a complete perspective of the evolution of the global digital rights management market throughout the above mentioned forecast period in terms of revenue (US$ Mn). The market overview section of the report demonstrates market dynamics such as drivers, restraints, and opportunities that influence the current nature and future status of this market, key indicators, integration challenges, end-user adoption analysis, and trends of the market. A market attractiveness analysis has been provided for every segment in the report, in order to provide a thorough understanding of the overall scenario in the digital rights management market. The report also provides an overview of various strategies adopted by the key players in the market. The report segments the market based on component into software and services. Further, services are segmented as consulting, integration, operations and maintenance services. In terms of software deployment, analysis has been provided for on-premise and cloud models. Based on end-use, the market can be categorized into healthcare, BFSI, government, media & entertainment, retail, and others. The report provides in-depth segment analysis of the global digital rights management market, thereby providing valuable insights at the macro as well as micro levels. The report also highlights the competitive landscape of the market, positioning all the major players according to their presence in different regions of the world and recent key developments initiated by them in the digital rights management market. The comprehensive market estimates are a result of our in-depth secondary research, primary interviews, and in-house expert panel reviews. These market estimates have been analyzed by taking into account the impact of different political, social, economic, and technological factors along with the current market dynamics affecting digital rights management market expansion. This report provides all the essential information required to understand the key developments in the digital rights management market and expansion trends of each segment and region. It also includes strategies, financial information, and SWOT analysis under the company profiles section. The report provides insights related to trends and their impact on the regional market along with Porter’s Five Forces Analysis which provides an overview of bargaining power of buyers, suppliers, threat from new entrants and potential substitutes, and degree of competition in the digital rights management market. This study provides a comprehensive ecosystem analysis of the digital rights management market, explaining the role of various participants including software & third-party vendors, system integrators, and distribution channels of the value chain operating in the market. The research methodology is a balanced combination of primary research, secondary research, and expert panel reviews. Among secondary research, sources such as annual reports, company websites, broker reports, financial reports, SEC filings and investor presentations, national government documents, internal and external proprietary databases, statistical databases, relevant patent and regulatory databases, market reports, government publications, statistical databases, World Bank database, and industry white papers are usually referred. Primary research involves telephonic/face-to-face interviews and e-mail interactions, for detailed and unbiased reviews on the digital rights management market, across geographies. Primary interviews are usually conducted on an ongoing basis with industry experts and participants in order to get the latest market insights and validate the existing data and analysis. Moreover, the data collected and analyzed from secondary and primary research is again discussed and examined by our expert panel. The research study includes profiles of leading companies operating in the global digital rights management market. Key players profiled in the report include Conax AS, Intertrust Technologies Corporation, Adobe Systems Incorporated, Oracle Corporation, Apple Inc., Microsoft Corporation, Locklizard Limited, Vaultize Technologies, Verimatrix, Inc., OpenText Corp., Seclore Technology, Vera Security, Inc. Vitrium Systems Inc., Dell EMC, Fasoo, Inc., Intralinks, Inc., and Nextlabs, Inc. among others.